In this section you will find packs of assorted decorative buttons with a dog them, which will be very useful to complete patchwork projects and also to decorate any other project of sewing, knitting, crochet, felt, etc., or to decorate a gift's wrapping, bags and more. We also have some loose buttons with dog designs, mainly in plastic. The assortment of these buttons changes frequently, do not hesitate to return later to see if there are new models. Buttons in the shape of a pet's paw print are suitable for dog and cat themes, since it is a generic design. You can find these buttons sold per unit or in packs with many units. In this section there are several models of buttons shaped like bone to serve as decoration to sewing and craft projects with a dog theme. They are usually buttons with two holes in different colors, and they can come in packs, although in general they are sold per unit. You will find some models of heat-adhesive patches for clothing with dog designs, mainly of infantile type. Here you can also find decorative ribbons with prints or embroideries of puppies playing or posing, to give a fun themed touch to your sewing project. Product Description: Decorative buttons and embellishments with the shape of a little dog and their delights. Ref. Dress-It-Up: 4236. Suitable for craft and scrapbooking, card making and patchwork projects.Content: 6 buttons and 2 embellishments (collar and a flower)Diameter: between 17 and 35 mm.Material: Plastic. Product Description: Buttons with the shape of a head of a dog. Ref. Dress-It-Up:4825. Suitable for craft and scrapbooking, card making and patchwork projects. There can be little color variations when compared to the picture. Content: 7 different buttons. Diameter: 23 to 27 mm approx. Material: Plastic. Dress-it-Up - dog Gone It! 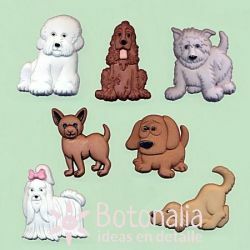 Product Description: Decorative buttons with the shape of a dog of different races. Suitable for craft and scrapbooking, card making and patchwork projects.Content: 5 different buttons. There can be little color variations when compared to the picture.Diameter: 25 to 30 mm approx.Material: Plastic. Product Description: Decorative buttons with the shape of dogs. To be used in needlework, craft, scrapbooking, patchwork and card making projects.Content: 7 buttons (dogs) in different models.Diameter: 25 to 34 mm approx.Material: Plastic. Iron-on sticker (patch) with an embroidery of a small dog in light grey color.Content: 1 iron-on sticker.Diameter: approx. 45 mm. Material: Textile. Decorative button with the shape of a dog, Puppy Parade de Dress-it-Up. Perfect for crafts and projects of scrapbooking, cardmaking, patchwork, etc. Content: The shown price is per unit Diameter: 33 mm approx. Material: Plastic. Decorative button with the shape of a dog, Puppy Parade de Dress-it-Up. Perfect for crafts and projects of scrapbooking, cardmaking, patchwork, etc. Content: The shown price is per unit Diameter: 30 mm approx. Material: Plastic. Decorative button with the shape of a dog, Puppy Parade de Dress-it-Up. Perfect for crafts and projects of scrapbooking, cardmaking, patchwork, etc. Content: The shown price is per unit Diameter: 32 mm approx. Material: Plastic. Decorative button with the shape of a dog, Puppy Parade de Dress-it-Up. Perfect for crafts and projects of scrapbooking, cardmaking, patchwork, etc. Content: The shown price is per unit Diameter: 31 mm approx. Material: Plastic. Decorative button with the shape of a dog, Puppy Parade de Dress-it-Up. Perfect for crafts and projects of scrapbooking, cardmaking, patchwork, etc. Content: The shown price is per unit Diameter: 25 mm approx. Material: Plastic.